What to do: Color small blocks of colors on the paper. Place the paper on the cookie sheet. Place the cookie sheet on a table or floor somewhere in the center of the searching area. Have your child wonder the house or outside collecting things to match with each color block on their paper. Language and Communication: Ask them what color they see or that they are looking for. When they bring back an item ask them what color it is or why they brought it for a specific color. If they are wrong, tell them what color you see and ask them if that would match another spot on their sheet. This encourages problem solving and color skills. Expand the Activity: Buy or locate specific items in your home for them to find that match the colors. Require that they find a specific number of items for each color. 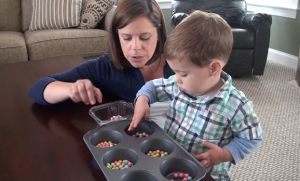 What to do: Dump the buttons onto the floor or table and place the muffin tin in front of your child. Place one of each different button into the muffin tins. Have your child sort the remaining buttons into the tin. While they are sorting the buttons have them count how many they have all together or in each tin. Language and Communication: Ask your child why they choose to sort the buttons the way they have. Depending upon the buttons you use, you may have options to sort them by shape, color, or size. Make sure you are discussing these options with your child. Expand the Activity: Make a pattern in the way the buttons are sorted. For example, purple squares, green squares, red squares, purple circles, green circles, red circles. See if your child can find the pattern or talk about it with them. Materials: Variety of sensory objects (fruits, vegetables, flowers, leaves, wood, bells), basket or tray, magnifying glass and a knife. What to do: Put the items into the basket or onto a tray and have your child sit with it. Have them smell things, play with them for noises, touch them, taste them when applicable. (Note: cut fruit and vegetables into small enough bites to prevent choking hazards. Vegetables should be cooked to soften them.) Place one item on the tray at a time and have the child touch them, feel them, listen to them, smell them, and look at them. Use the magnifying glass to look closer at the items. Language and Communication: Ask your child what things smell like, feel like, taste like, or look like. Introduce the vocabulary that we see with our eyes, touch with our hands, smell with our nose, taste with our mouth, and hear with our ears. Ask them about who eats different items you may have. For example, if you have leaves- Who eats leaves? Do we eat leaves? This will explore the idea that not only humans have senses but animals also. Encourage them to see if unconventional items have sounds. Do this by asking them if they can hear an orange or lettuce by squeezing them or rustling them around. Talk about how the magnifying class allows them to see things closer and more detailed. This uses their sight sense and teaches them that tools help humans to accomplish tasks.